“Where is this field being used?” I bet you’ve asked yourself that question quite a bit! While it’s easy enough to determine if a field is on the page layout, or visible to users, it is not as easy to identify workflows, reports or Apex code where the field is being used. And that’s a bad thing. 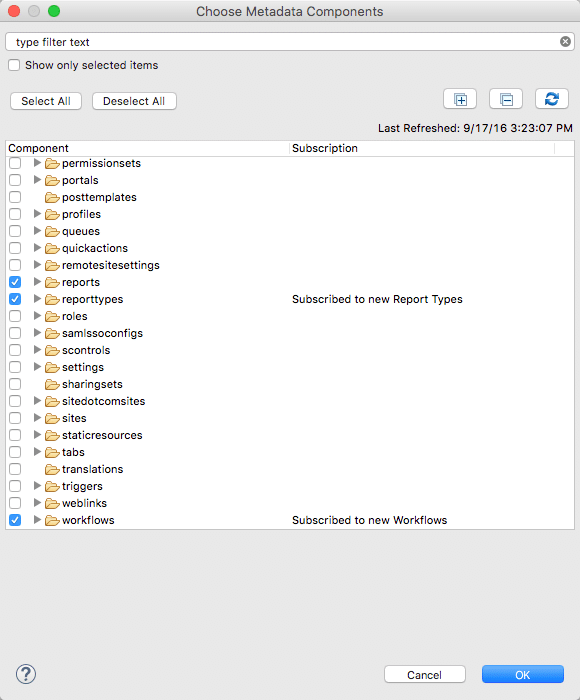 While it would be nice to have a declarative option built into Salesforce for this type of reporting, the Force.com IDE offers this reporting ability today. Yet, many Admins stray away from using it because it seems too complex. Well, I’m here to tell you that it’s not as difficult as you would imagine! What is Eclipse & the Force.com IDE? Eclipse is a developer tool used by all types of developers across the world (not just Salesforce). Think of Eclipse as a shell with some built-in functionality to execute actions, search and write code and the like. Depending on what platform you’re building in, an IDE is installed to provide additional, platform specific functions. That’s where the Force.com IDE comes in. 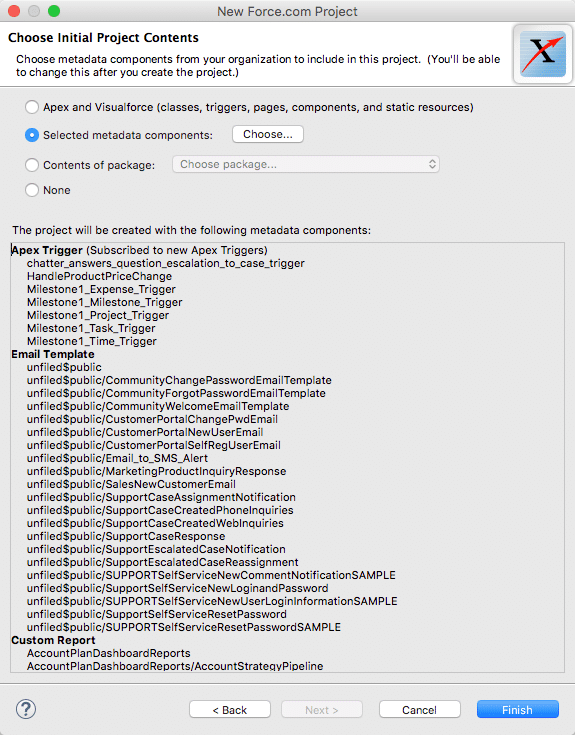 Once Eclipse is installed, we need to install the Salesforce developed Force.com IDE to do anything with Salesforce metadata. Now, I’m no expert; this is a layman’s definition so if any developers reading this want to provide a better explanation, please do so! First thing’s first – we need to install Eclipse. Click here to access the Eclipse software. The current version as of this writing is Eclipse Neon. Follow the onscreen prompts to install Eclipse on your computer. Once Eclipse is installed, it’s time to install the Force.com IDE. Again, these instructions are pretty straightforward and can be found on the Salesforce Developers site. 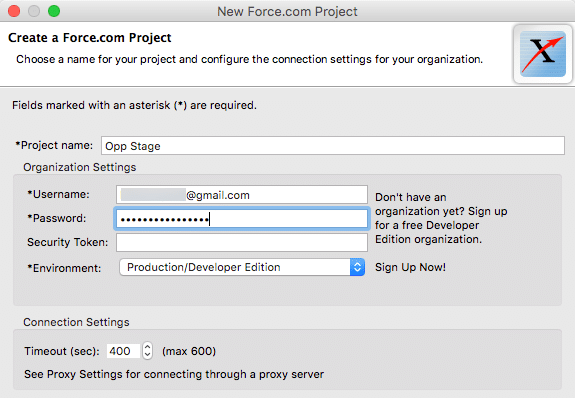 Now that the Force.com IDE is installed into Eclipse, it’s time to create a Force.com Project. The project will contain metadata elements that, in our example, we want to query. We’ll use the very easy wizard-like series of screens to create a project. First, click the down arrow next to the New icon and then select Force.com Project. Next, provide your Login Credentials to the Salesforce Org you want to query and click Next. Next, select the metadata components that you want to query. Today, I’m interested in finding which reports, report types, email templates and workflow rules the field is used so I’ll select those metadata components. Remember, less is more here – especially for large databases! Depending on how large your dataset of the components selected, you’ll get this screen. Don’t panic. It can take several minutes to pull everything together. Take this time to get a refill on coffee, or do some deep breathing! Confirm the metadata components and click Finish! 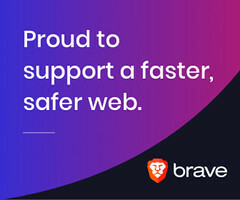 You’ve successfully created a Force.com Project and you’re ready to start searching your metadata! Eclipse has now pulled all of the metadata down and is now searchable in the Force.com IDE. This is where the fun really begins! 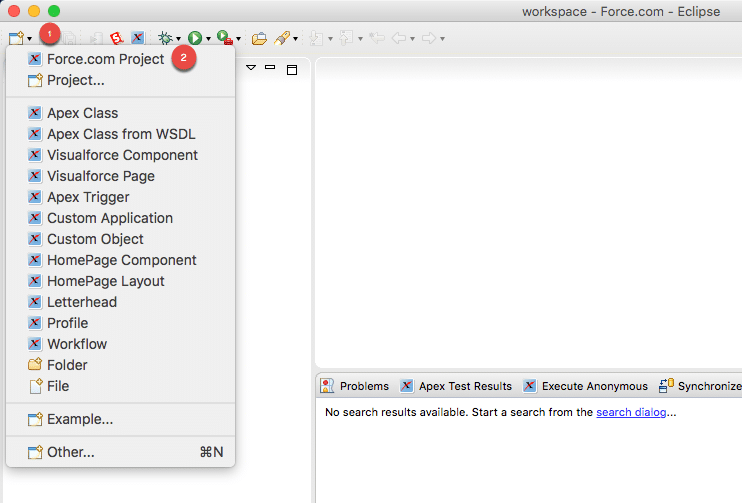 After the Force.com Project is created, you’ll be redirected back to the Eclipse Workspace. This is where we’ll perform the analysis. In this example, my project name is called Opp Stage because I want to see where the Opportunity Stage field is being used in the metadata components I pulled down. Notice that I selected email, reports, triggers, and workflows so these are the components available to me to query against. I’m going to start my query by clicking on the src folder. This will query all of my metadata components and return results. However, if you have a large number of reports, it’s probably better to select the reports folder to perform the search. In the toolbar, click Search then Search again to open the search tool. For this specific search, we’re looking at a field which means we’ll want to use the field’s API name. In this case, the standard Stage field on the Opportunity record has an API name of StageName so that’s what we’ll enter into the search box. Keep in mind that custom fields will end in a double underscore c (i.e. Custom_Field__c). In the File name patterns picklist, choose everything. We want to produce the broadest search possible. Once you’re ready, click Search. Once the query generates, use the bottom panel of the Workspace to explore the results! 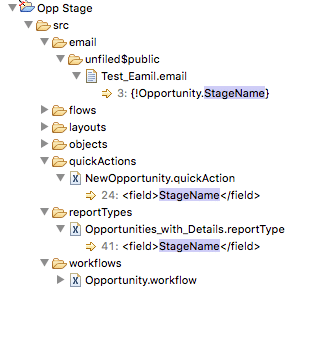 Here we see that StageName can be found in several locations in my org – specifically in an email called Test Email, in a Report Type called Opportunities with Details and in a workflow rule. Double clicking on any of these results will provide additional detail as to how it’s used. If the field is used as a report filter, you’ll be able to identify that here which will help you to identify which reports need to be updated. So, what field are you itching to practice with? Nice article Brent! I’m already somewhat (okay, not really) familiar with the Force.com IDE, but that’s an excellent way to use it! I had always thought of it as just a tool for migrating metadata, but I guess I’m wrong! That’s a great way to search for where fields are used, and look at one angle of what impact removing a custom field will make. I’ll make sure to keep this use case in mind the next time I need to perform a task like this. Brent, this is soooo timely! I did get a JRE Missing error message when I installed Eclipse. Do I need to install BOTH the JRE and the JDK or just one of the other? I think you do need Java to use Eclipse. Good catch, Stephen! I’ve updated the post. Never mind, my IT guy helped me figure it out. Apparently I had to remove my proxy settings and go on our guest network in order to install the plugin, but then I had to add the proxy settings back in order to create the force.com project. I don’t understand proxy settings, but at least it’s working for me now. Cool! Glad you were able to get it working! This is so helpful! I have been looking for a way to search for a fields use in reports so this post is exactly what I needed! It also finally pushed me to explore the Force.com IDE! Thank you for writing this. Great article especially helpful for admins like me trying to clean up my other thanks for putting all this info together. Thanks for reading! Glad you found it useful! 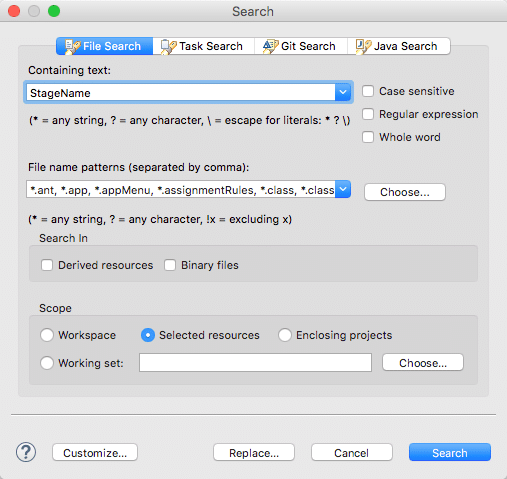 Good post on searching metadata via force.com IDE. I need to do exactly the project you described (figure out where Opportunity Stage is used) and your post was very helpful, especially the sections from “Creating a force.com Project” on down. The video gives simple step-by-step instructions for getting JRE and Eclipse installed, in 7 minutes. I futzed around for 30 minutes trying to get it tow work before I found this video. Thanks for sharing that video Garrett! Very helpful. SO HELPFUL! This is exactly what I needed. I wish this was built into Salesforce so the process could be quicker but at least we have this for now. Thanks so much for posting! Awesome! Glad you found it useful Jeremy! Thanks for reading. Nice post! But I prefer to use JetForcer. I find it more convenient for Force.com development. This is a great article, my problem is what happens if you search for a field called “Sale__c” but you also have another that is called “Is_Sale__c”? I have more than a 2000 results of usage but they are mixed between Sale__c and Is_Sale__c. How can I search only for Sale__c? I don’t recall what the setting or option is off the top of my head, but there is an option for an exact search which would limit your query to the provided text. What do you suggest now that Force.com IDE is not supported? Hi Meg! Check out The Welkin Suite. 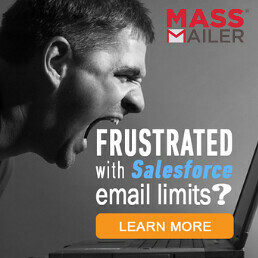 They have a great product which is much more robust and offers some great Admin functionality.